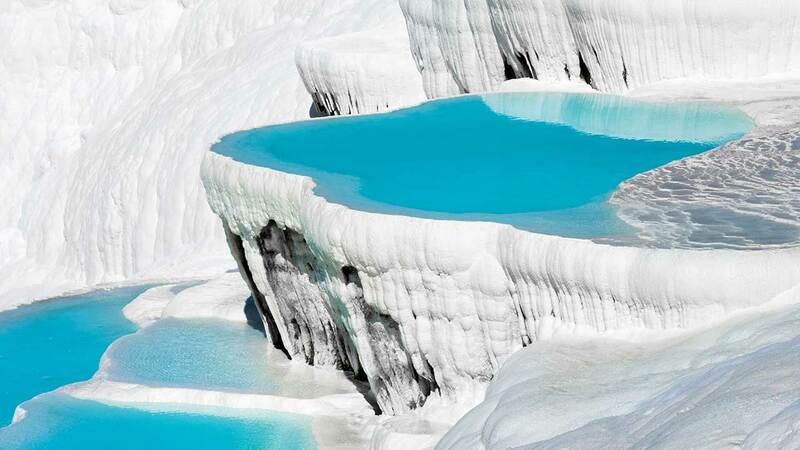 A great combination tour of Pamukkale & Aphrodisias, visiting the oldest spa center in the world and city of the goddess of love & beauty. 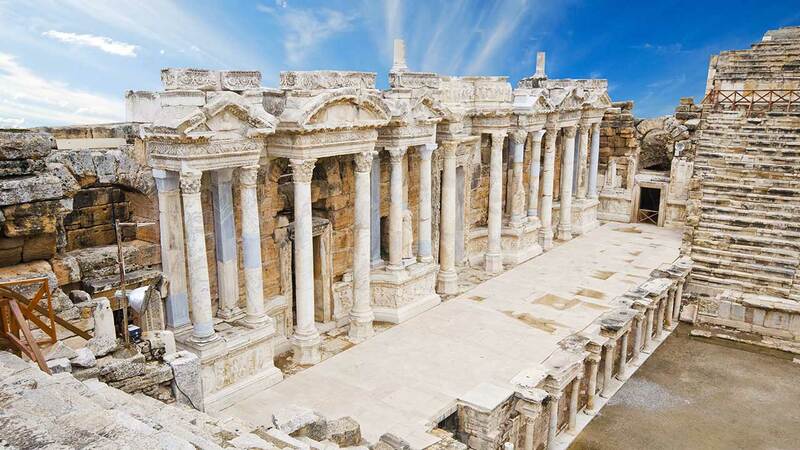 You can also check daily Pamukkale (Hierapolis) or Aphrodisias tour if you wish to explore them separately. A great chance to visit two very important and beautiful ancient cities and attraction centers in western Turkey in one day. 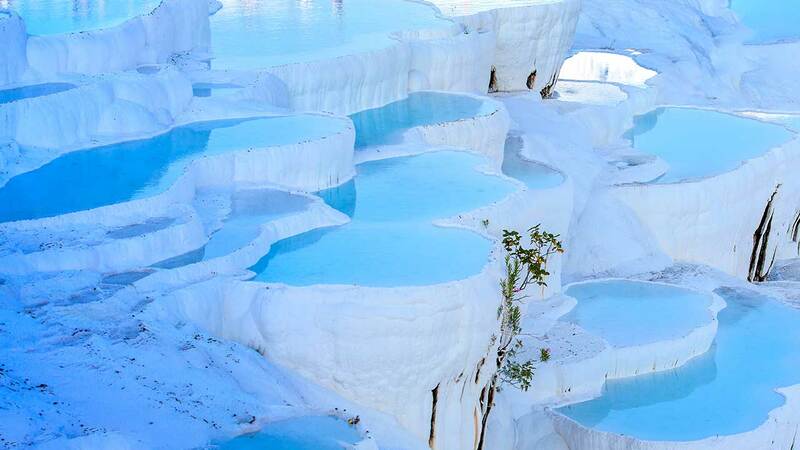 Pamukkale is the oldest spa center in the world. The Antique Pool, originally from Roman age, has been modernized for the visitors to enjoy. The environment embellished with pines, oleanders, palm trees, and flowers add to its charm. 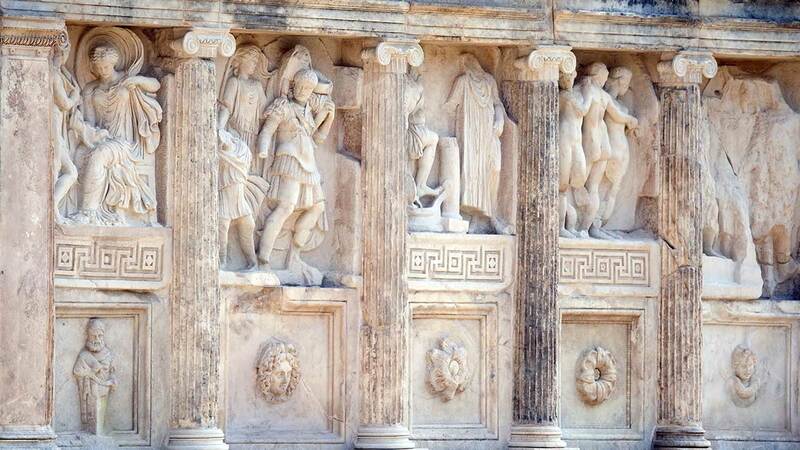 Aphrodisias; in the city of the goddess of “love” and “beauty”, it is but impossible not to see aesthetic expressions of life and artistry everywhere. 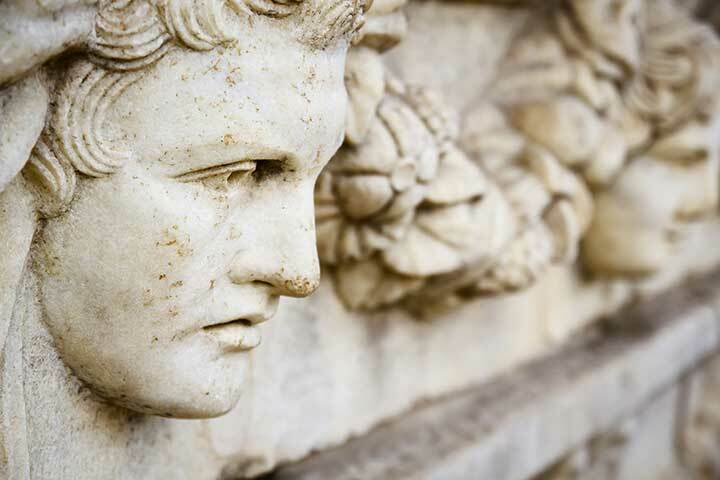 An unrivaled School of Sculpture adorned whole of the ancient world for hundreds of years. You will tour the legendary city of “love” and “beauty”. The Tetrapylon will welcome you on your way to the Temple of Aphrodite. The whole city is adorned with the artifacts from the School of Sculpture whose fame surpassed the limits of the Roman Empire. The Odeon was also used as Bouleuterion and later was used as a palaestra. The Stadium could hold 30,000 spectators and it was one of the best-preserved in the Mediterranean. Partially used as an arena too. An inscription on the propylon of Sebastion says: “To Aphrodite, the Divine Augusti, and the People”. Baths of Hadrian was an important meeting point for select people, also for emperors. The theater was dedicated to Aphrodite and the people of the city by Julius Zoilos who was a slave before. The Agora was the large market area between the Temple of Aphrodite and the Acropolis. It was used for musical events, public gatherings, and speeches as well as literature competitions. 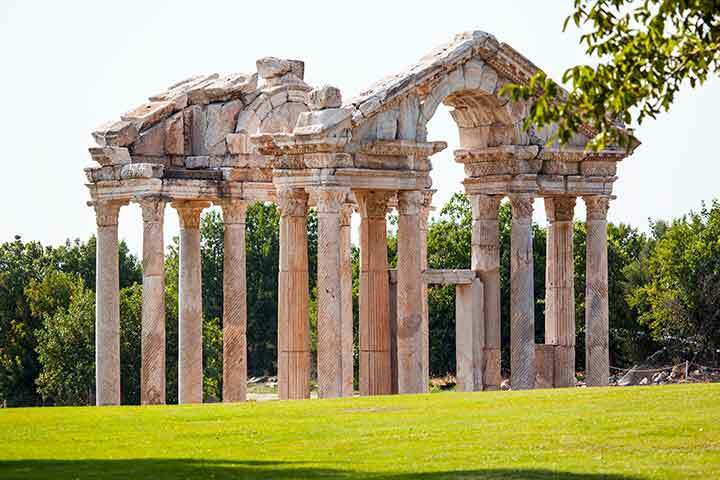 On this Pamukkale & Aphrodisias tour, you will be driving in the fertile Meander Valley, the very land where the noun and the verb were born. The museum near the ancient site is well-known in the world; especially among archaeologists, archaeology lovers, students of Fine Arts and sculptors. The museum contains a large number of finds unearthed in the excavations in the area. Prehistoric artifacts date back to 5000 BC and the museum will take you through the ages of the Archaic, Classical, Hellenistic and Roman Period objects, sarcophagi and statues made by the sculpture school of the time and contains the stunning cult statue of Aphrodite as well. The halls of the museum are The Imperial Hall, the corridor of Zoilos, hall of Melpomene, Odeon Hall, display cases gallery, hall of Penthesilea, hall of Aphrodite and courtyard where the best examples of the artifacts created by the city masters of marble are at display. This is a city which started as a small settlement near the hot springs around 3rd century BC and has flourished to be a well-known health center until now. The main street is adorned with gates on both sides, the graceful three arched Domitian Gate deserves visitor's special attention. 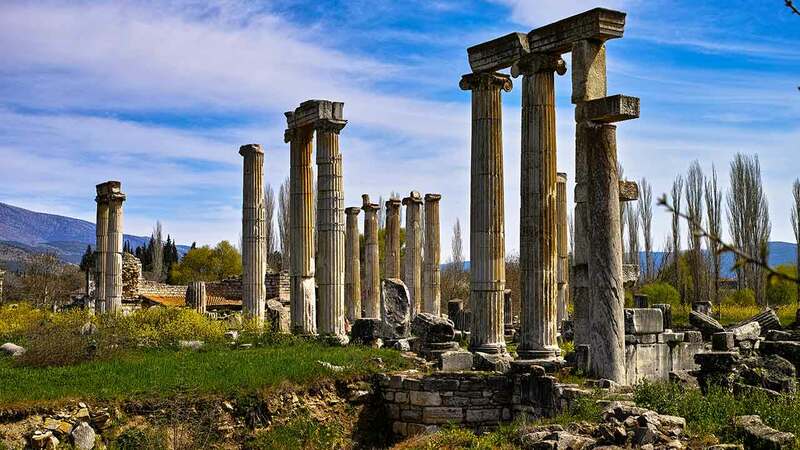 The Temple of Apollo was built over an active fault called the Plutonium. A Cybele cult center had transformed in time to be a most famous oracle center for the region. The theater will be a perfect location to be during the sunset. It contains the most complete and best-preserved collections of Greco-Roman theater decorations in Turkey. The Necropolis is another best-preserved merit being the largest one in Turkey with 1,200 tombs in several different forms. Martyrium of St. Philip on top of the hill and Nymphaeum from the 2nd century AD are the other places of interest. The Roman Bath is used as the Hierapolis Archaeology Museum today housing remains from Hierapolis city along with some of the neighboring ancient sites and some very important findings from Beycesultan Mound.